I have acquired a couple new things for the house. :: Beautiful magnet clips from the oh-so-talented Courtney over at Wunderbug. I let Courtney choose the color and I'm glad I did because she picked out one of my favorite shades of green with an amazing ivory print. These little clothespin clips have magnets on the back and they are now happily living on my magnetic chalkboard, holding important bits of paper. You can get some for yourself in her Etsy shop. 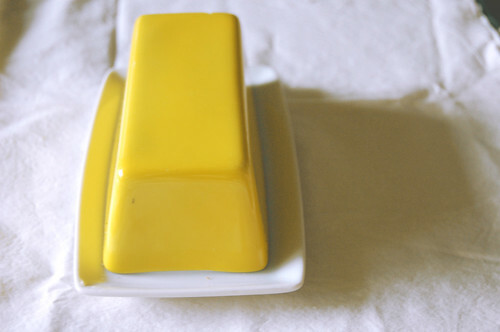 :: A bright yellow ceramic butter dish from the thrift store ($2). We've lived without a butter dish for a long time, so I snatched this one up the moment I saw it. I guess I was just waiting for the right one. :: And some of you have already noticed the milk glass plate coyly hiding under my birthday cake. It was another thrift store find ($4) and I love that I can weave ribbon through the edging. It's just right for a 6" cake. that little touch of grosgrain ribbon is just darling and pops perfectly against that milk glass. Oh those clothespin clips are adorable and I love love love the colour and print on them - so gorgeous! I'm always impressed with your thrifty finds Rachel- your butter dish is lovely and your milk glass plate looks so pretty with the ribbon threaded through! Lovely finds! How wonderful that the top of the butter dish is, itself, the color of butter. I'm about to post something and give a little shout-out to you, so stay tuned, okay? 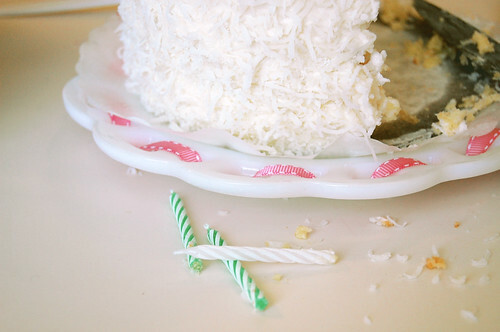 Oh, my that cake plate is too cute--love the idea of ribbon through the little wholes. Creative as always Rachel! that butter dish is adorable... so fun! such great finds! i think i'm going to have to snag some of those clothespins! Wow, that cake plate is gorgeous, what a find! 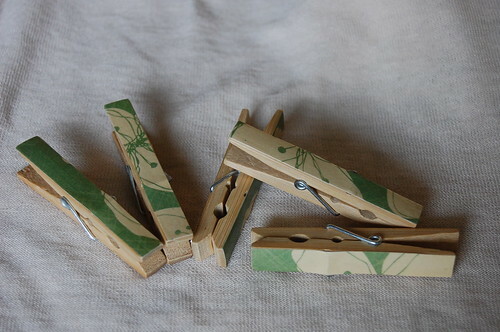 And those clothespins just gave me a DIY idea, thanks! You surely have a gift for finding the most lovely pieces! Those clothes pins are great- I can think of a zillion uses for them. These are all so lovely! They feel like summer. Cute cake plate! Great idea! I love it all! The clothes pins are so lovely...it's all in the small details, no?